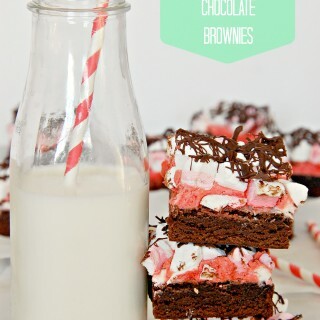 Peppermint and chocolate is the perfect flavor combination for the Christmas season. I’ll peppermint anything I can, even if it’s not chocolate, as is probably obvious by now(see HERE, HERE, HERE, HERE, HERE, HERE, and HERE). Yep. Love me some mint chocolate. 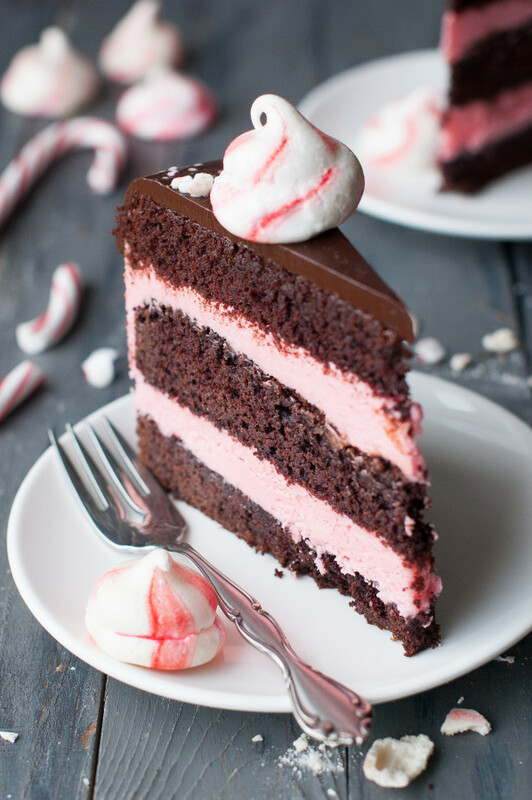 This Peppermint Chocolate Holiday Cake makes a wonderful, stunning dessert for any party or occasion. 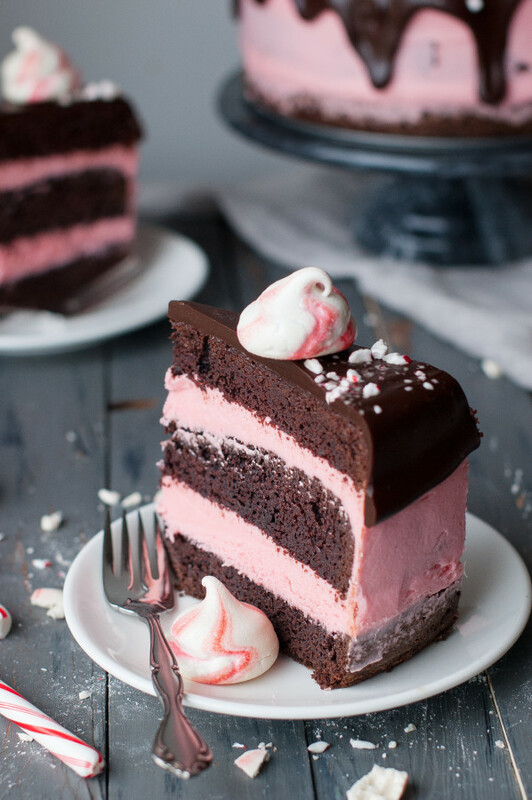 Layers of dark chocolate mint cake are frosted with a pink peppermint cream cheese buttercream. 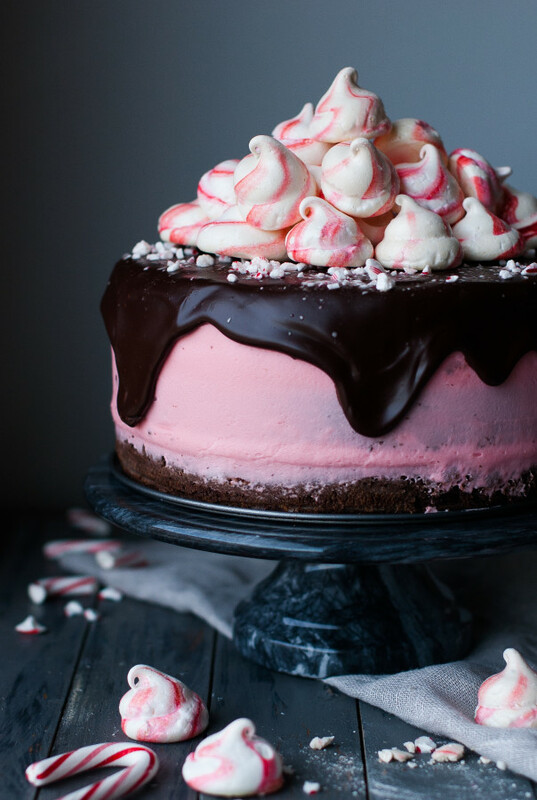 Rich ganache is draped over the top and the whole cake is sprinkled with crushed candy cane and these little Peppermint Meringue Kisses make the perfect, festive garnish. The cake itself is easy enough to frost, seeing as perfection is not required thanks to the thick layer of chocolate ganache that blankets the top, easily hiding any imperfections. 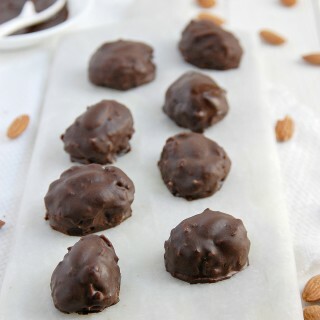 The ganache itself is ridiculously easy to prepare. 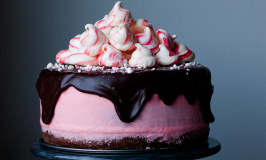 You will need to remove the meringues from the top before slicing. After each slice is cut, top with a meringue or two, and place some on the side of the plate, if desired. Keep your slicing knife in a large cup of boiling hot water. This will make your cuts smooth as the hot knife will glide through the cold cake. Keep a towel close by that you can use to wipe the water off the knife before each slice. Make the chocolate mint cake according to recipe instructions, baking in 3, 8" baking pans instead of mini bundts, Let cool and level the tops off. 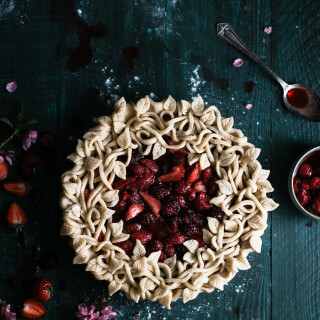 Place the butter, cream cheese, salt, and a little red food color together in the bowl of a stand mixer and beat together with the paddle attachment until smooth and creamy. Add in the vanilla and peppermint extract. Add ¼ of the powdered sugar and beat on low speed until incorporated. Add 1 T. of milk and beat into the frosting. Add another ¼ of the powdered sugar, beating in on low speed until incorporated. Add another T. of milk and mix in. Repeat this process until all the powdered sugar is incorporated. Add more milk, if necessary, until desired consistency is achieved. Scrap the bowl down with a rubber spatula. Beat one more time on medium speed until the frosting is smooth. Frost the cake with the peppermint frosting, keeping the frosting level between each level, covering the cake with the frosting and smoothing over the top and sides. Chill in the fridge. Place the chocolate chips and heavy cream in a microwave safe bowl and heat in the microwave at 30 second intervals until the cream is very hot. Whisk the chocolate and cream together until smooth. Pour the ganache over the top of the cake, in the center, and spread it to the edges of the cake, nudging portions of the ganache over the sides and allowing it to drip down. Smooth the ganache on top of the cake. 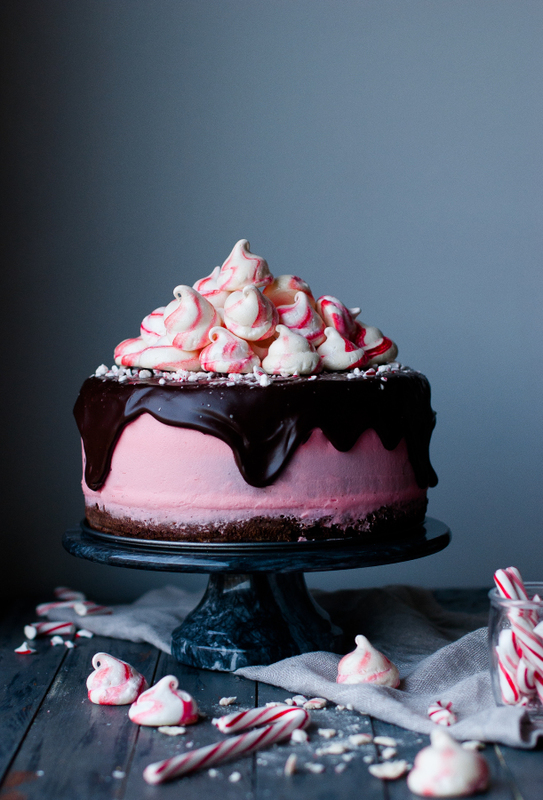 Sprinkle the crushed candy cane around the top edges of the cake. Refrigerate until the ganache is firm and set. 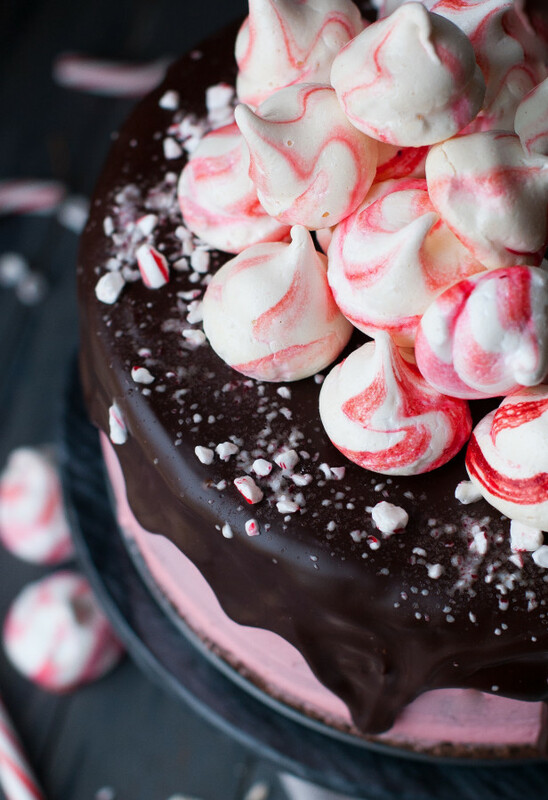 Top with peppermint meringue kisses before displaying or serving.